Teriyaki Shish Kabobs | And sometimes I cook. Combine first 5 ingredients; toss with beef. Cover and refrigerate overnight. Drain beef, reserving marinade. Thread meat, pineapple and vegetables, alternately on metal or soaked bamboo skewers. Grill over hot heat for 15-20 minutes, turning often, or until meat reaches desired doneness and vegetables are tender. Simmer the marinade in a small saucepan over low heat 15 minutes. 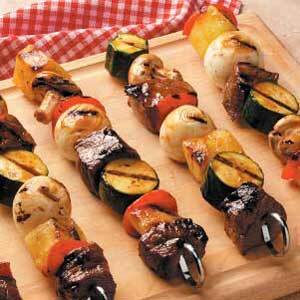 Remove meat and vegetables from skewers; serve with marinade. Filed under Beef, Grilling, Healthy, No oven necessary.